The Stillwater Bridge question is back in the news, with Governor Dayton and Representative Bachmann endorsing a new four lane bridge to connect to the future development in Wisconsin. Senator Franken is apparently undecided. Franken takes a bridge tour. MnDOT’s information page is here The costs are quite high MnDOT estimates $633 M for a four-lane bridge. 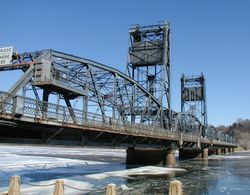 “This report is prepared … to assess the expected traveler impacts of replacing or not replacing the Saint Croix River Bridge in Stillwater, Minnesota. The model that has previously been used to evaluate different Lafayette Bridge replacement scenarios is applied, using the 20 county (“collar counties”) network from the Metropolitan Council and best estimates of 2010 land uses (population and employment). The model evaluates changes in travel cost due to network reconfigurations corresponding to different scenarios. These costs would need to be compared against construction and ongoing operations and maintenance costs, and do not account for factors such as travel time reliability, the value of a redundant network for planned or unplanned closures, or changes in land use. It can be safely assumed that were a wider, faster bridge constructed there would be more development, and thus more travel demand from the Wisconsin side of the Saint Croix River. If no replacement bridge were built, we can assume that less growth (if any) would occur, and cross-river traffic would diminish. This model does not account for changes in land use, as we do not believe this has been accurately forecast for scenarios both with and without the bridge, but does account for changes in demand given the current land use under different network configurations. This is denoted as “Variable Trip Tables” in the report. Compared to the baseline (a replacement 2 lane bridge in the same location) according to the model, Construction Alternative 1, a new 4 lane bridge, produces an economic gain of $1.8 million per year. Again, this comes down both to Benefit / Cost analysis (does this pass a test?) and priorities (does this count as “Fix It First”?). I think building a four lane bridge to replace a two lane bridge does not fully count as “preservation”, but rather as “expansion”. Given the state of the network, and the need to give priority to preservation, a four lane bridge violates that principal. As to whether a four lane bridge passes a B/C test, or better yet, a market test of whether a private firm would build it, the answer is clearly no. This four-lane bridge would not have enough demand to pay the tolls required to fund it. That should tell you something about its true necessity. The Franken article cited above suggested Wisconsin wasn’t interested in funding it. Since the majority of benefits for the bridge accrue to Wisconsin land owners, it makes no sense for Minnesota to lead on this. What happens to the growth that would have occurred on the Wisconsin side under the no-build scenario? Couldn’t you assume at least some of it would occur in Minnesota instead (a positive for our tax rolls)? Is it possible to assign the benefits and/or costs to WI or MN sides of the river? @Charles. Yes. Imagine two islands, a big island with a city, a little island with farms, connected by a ferry. You build an untolled bridge. Everyone’s accessibility goes up, but the little island sees land prices rise more because it can now access the city, which is valuable, while everyone else can now access the farms, which is not particularly. The value of the time savings and the potential access is capitalized in the land. The owner of the island benefits far more than the others, even in aggregate. You say the majority of benefits go to WI. Do your results allow reporting of the change in consumer surplus attributed to residents east (or west) of the St. Croix? In other words, does the detail behind the report allow for disaggregation of economic benefit (or cost) to TAZ groups representing each side of the river? That quantification could reveal whom the project might benefit, which may shed light on who should lead the project’s implementation and funding. Or perhaps accessibility benefits cannot be sequestered to residents and monetized geographically as I suggest. Either way, an interesting project. @Charles. The model would allow it, but we did not actually generate those results though (since it was beyond our remit), and was not relevant to a benefit/cost analysis (though it would be relevant to a distributional or financing analysis).